The SAG Foundation’s New England BookPALS did not slow down during the recent school vacation. We created opportunities for new volunteers to get involved and read to students at the Bentley School in Salem, MA, for a special week of academics, sports, and enrichment. 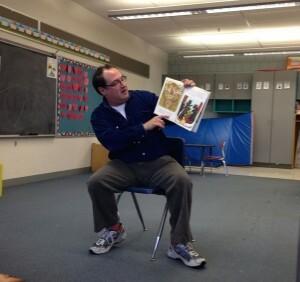 Local actor and BookPAL Jeff Bellin (pictured above) entertained 1st through 3rd graders with his telling of Mucky Moose and I Need my Monster, while BookPAL Constance Shute read a novel to older students.